Fast and Safe is an adware program which exhibits behavior similar to adware helpers, such as Sprotector and Bprotector, which do not allow additional programs to alter the settings of your Internet browsers. Fast and Safe is published by Globaldev and is distributed by various free programs. In order to prevent adware programs and other undesirable programs, you should always pay close attention to the information that you are provided when installing any piece of freeware. If it is too late, i.e. you have already installed Fast and Safe, move down to the last section to learn how to effortlessly remove Fast and Safe from the computer. Fast and Safe creates its folders in the ProgramData directory and ALLUSERPROFILE directory. Moreover, it creates several services such as SYSTEM\ControlSet001\services\64af91bf and SYSTEM\CurrentControlSet\services\64af91bf. Once installed, Fast and Safe starts monitoring computer user’s online behavior, including search terms, click, browsing preferences, time spent on various websites, language settings, browser type and other non-personally identifiable information. Due to the fact that the program runs in the background, you may not suspect that it is present on your computer. However, Fast and Safe may display various advertisements, which you should disregard. It is crucial to ignore pop-ups displayed by Fast and Safe because they might take you to dangerous websites. There are many deceptive websites promoted by adware programs, and it is also important to note that the developers of adware programs are not liable for the offers delivered to the users. Phishing websites may promote some updates for your software programs or invite you to take part in a quiz so that you can get a chance to win some reward. It is highly important to ignore such offers because your interaction with questionable websites may have adverse consequences. Below you will find our step-by-step removal guide which will help you uninstall Fast and Safe or any other undesirable program. But you should also bear in mind that this method of removal may be insufficient. We recommend that you rely on a powerful spyware and malware removal program especially if you do not own any computer security program. If you want to get rid of Fast and Safe and be safe on the Internet, implement SpyHunter, which will take care of the security of your operating system. 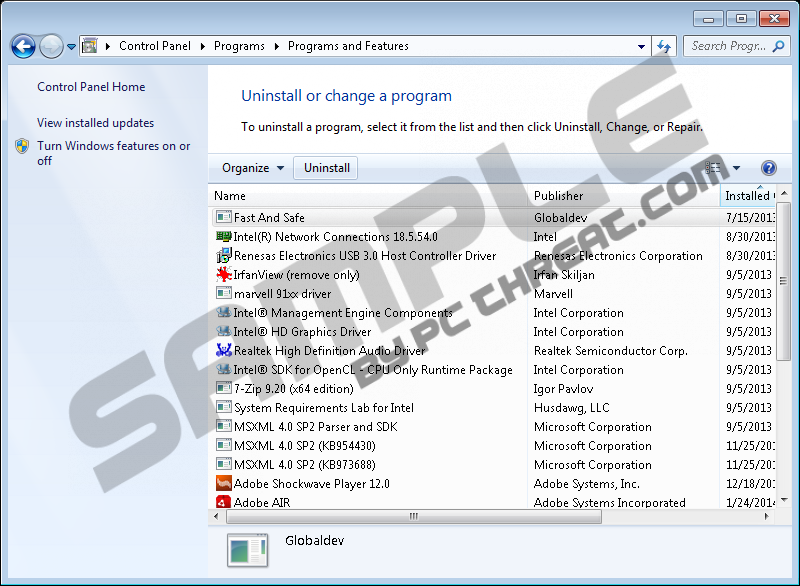 Click Uninstall a program and remove the adware program. Quick & tested solution for Fast and Safe removal.